I"m posting this here mainly because a PW with X on its casting cost is a brand new thing, which makes it hard to evaluate how good that is and I love to discuss new mechanics. I mean, late game it can deal 10 hasty damage when it comes into play, with evasion, which can be relevant. Scry 2 is not that bad, but it isn't CA either. The 0 could be good in humans/hatebears, but that deck doesn't play blue. I wonder if just ramping mana up a few times would be enough for her to be good, or just the +2 threatening the 10 damage is enough (10 damage doesn't win the game though). I don't know, at 3 mana it just seems worse than Dack, therefore suffers the same problem 4cmc PWs do when compared to Jace. I think the Scry 2 is just there to help filter cards for the 0 ability. You can figure out which cards to draw and to make sure the card on top is something she could cast the following turn. @Dstinct It is there to help that too, but it helps poorly on that since you actually need to leave both cards on top for the +2 to work. Not that I think this will see vintage play. But if it does vintage always has SDT, jace, brainstorm and preordain to set the top card for the 0 ability. Bolt isn't really played as much anymore, but it still pops up. So this is 6 mana to come into play out of bolt range. 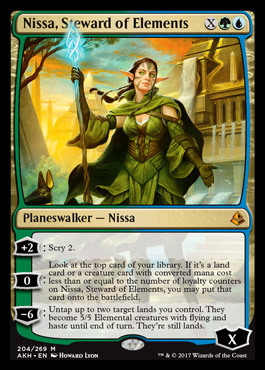 That aside Nissa's main problem is she can't protect herself and is just inferior in most of her abilities to existing planeswalkers. Jace lets you dig 3 deep and put 2 cards in your hand. Nissa only lets you see 2 deep. Narset works off of spells and puts them into your hand. Spells are still much more common and relevant in U decks than creatures ever will be. And Chandra gives you creatures to attack with (though not with flying) without putting your lands at risk to STPS. Its certainly an interesting card and at a glance its low CMC and the X seems to make it at least a consideration. But a closer examination shows this just doesn't do enough for vintage. I really like the design of this card (perhaps not so much the "ultimate" though), but unfortunately it's not strong enough to see play. Bolt isn't really played as much anymore, but it still pops up. So this is 6 mana to come into play out of bolt range. It's 4 mana to escape Bolt since you can +2 immediately. I don't think it's strong enough, but X in the casting cost is cool. I think this may be really good against grindy control decks. Same role as Sylvan Library against the Miracles type decks of the world. The scry gets around leovold unlike Sylvan Library, Jace and Dack. The 0 puts threats into play past Counterbalance or Standstill. The X in the cost lets you cast it into a Counterbalance. This is actually very much the kind of card I've been looking for the bant/Bug managorger decks that I play. Very good card. It's like a Sylvan Library that can be pitched to Force of Will. It can cast Mentor in a blue mirror for free with all your mana still untapped to defend it or make it even more disgusting than usual. It has definite long-game potential that is intriguing too. Eight mana now represents 10 flying haste damage! Blue mages will definitely have to reevaluate how much damage they want to voluntarily take from free spells in the mirror, as dealing 10 to self with fetches, Forces, Probes, and Missteps happens all the time. I really like how she puts lands and creatures into play under a standstill. That deck still plays Mana Drain in some number of copies, and this is definitely a mana sink. Very interesting card. Definately has potential. @Serracollector I think Christmas land is Cruicible / Strip lock with a Top to let you filter for the Exploration effect. I tested out Sindbad in a lot of my various Landstill Builds, as it was very very syergistic with Jace TMS, and Snapcaster Mage. This is far far better.